Preheat oven to 375°F. Cut the squash in half and scoop out seeds. Place squash halves on baking sheet, cut-side down. Prick the skin of the squash with a sharp knife. Bake for approximately one hour until flesh is tender. Cool slightly. 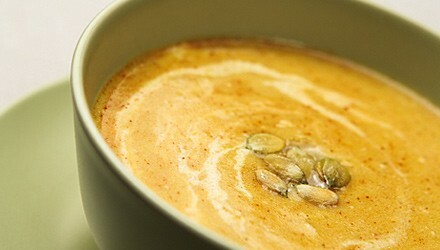 Scoop out 3 cups of cooked squash and place it in a blender or food processor. (Save any extra squash for another use.) Add some of the chicken broth to aid in blending. Sprinkle pistachio nuts, pepper, and allspice into the food processor or blender. Process until smooth and nuts are ground. When squash is smooth, pour into a large saucepan with remaining broth. Heat over low heat, stirring constantly until mixture comes to a slow boil. Stir in evaporated milk and continue to heat until soup bubbles and is heated through. Serve immediately.